Tailor’s bunion, also called a bunionette, is a prominence of the fifth metatarsal bone at the base of the little toe. 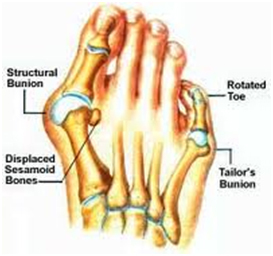 The bunion is actually the rounded end of the fifth metatarsal bone (the bone on the outside of the forefoot leading to the 5th toe) that is slowly splaying away from the outer side of the foot. It is referred to as a tailor’s bunion because tailors once sat cross-legged all day with the outside edge of their feet rubbing on the ground. 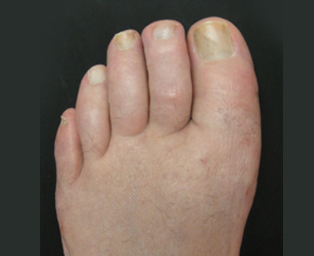 This produced a pressure area and callus at the bottom of the fifth toe. A bunionette occurs over the area of the foot where the small toe connects to the foot. This area is called the metatarsophalangeal joint, or MTP joint. The metatarsals are the long bones of the foot. The phalanges are the small bones in each toe. The fifth toe is pushed inward towards the fourth toe and the head of the 5th metatarsal pushes outward, causing it to press and rub against the shoe. Pain: The bump can increase in size over time, causing pain in closed toe shoe gear. The chronic rubbing of the bump against the shoe can also cause the area to become red and irritated, sometimes even leading to a callus. Swelling: Those affected may also notice that their foot appears to have gotten wider. This widening occurs because of a gradual separation of the fifth metatarsal bone from the fourth metatarsal bone that lies next to it. Redness: The painful area of the foot may become inflamed from pressure and rubbing from shoes on the bony bump. 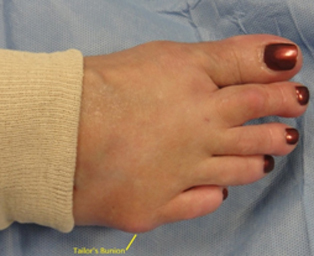 Plantar and Lateral hyperkeratosis: It is common for a callus to form on the skin. This is a natural defense of the body as it tries to protect itself. Symptoms are often worse after wearing shoes that rub on the affected area causing excessive irritation of the skin. 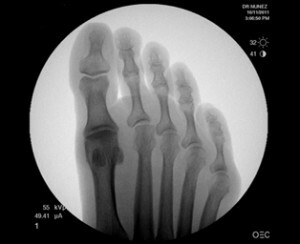 Physical exam: Physical examination of the foot reveals the abnormal bony protrusion. The structure and biomechanics of the patient’s entire foot is examined. X-rays: The diagnosis is confirmed with x-rays and they are usually ordered to help the surgeon determine the extent of the deformity. The first method of treating metatarsalgia begins with accommodating the deformity. The goal is to reduce pressure in the painful area. Footwear: Wear shoes with plenty of room for the toes to move, low heels, and laces or buckles that allow for width adjustment. Wear shoes with thick, shock-absorbent soles and proper insoles that are designed to keep excessive pressure off of the foot. High heels should be avoided because they place undo strain on the forefoot and can contribute to a number of foot deformities. Padding: Bunionette pads can be placed over the irritated bump area and may help reduce pain. Medication: Prescription anti-inflammatory drugs or over the counter non-steroidal anti-inflammatory medication (NSAID’s) may be recommended to ease acute pain and inflammation. Anti-inflammatories may help to decrease pain, but they don’t specifically target the primary mechanical problem contributing to the pain of a Tailor’s Bunion. Injection therapy: Corticosteroid injections may be used in an attempt to reduce the inflamed tissue around the joint. Orthotic Devices: Custom functional orthotics prescribed by your doctor can be useful in controlling foot function. An orthotic device may reduce symptoms and prevent the worsening of the condition by relieving pressure and redistributing weight from the painful area. Icing: An ice pack application may be advised to reduce pain and inflammation. This can be applied to the affected area several times a day for no more than 15 minutes at a time. 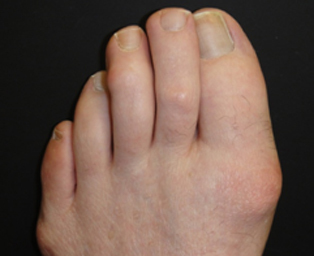 Conservative treatments for Tailor’s Bunions are often limited because they cannot correct the bone deformity that contributes to the symptoms. So, when conservative treatment fails or the pain progresses to the point where conservative treatment is no longer a viable option, surgical intervention may be needed to correct the deformity. 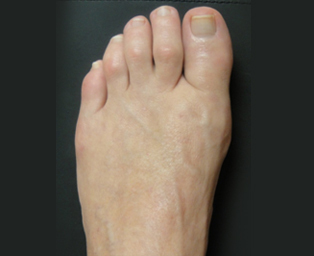 Both the traditional and minimally invasive Tailor’s bunion surgical correction techniques are performed at the Coeur d’ Alene Foot and Ankle Surgery Center. 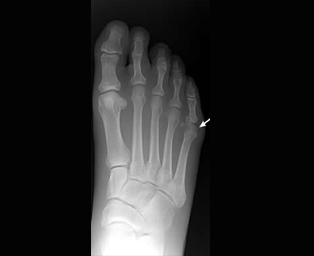 The surgery consists of removing the exostosis, or bony bump and may also involve cutting the 5th metatarsal bone just behind the toe to change the alignment and improve foot function and help prevent reoccurrence. Generally, the bone is then elevated and held in its corrected position to redistribute weight to achieve normal alignment. 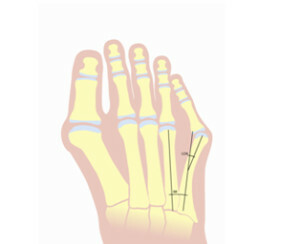 Open or traditional surgical correction techniques involve larger incisions to perform the removal of the bony bump and cutting of the metatarsal bone and elevation is accomplished by holding its corrected position with a pin, screw or plate. The incisions are then sutured. Following the surgery, the patient may be placed in a cast, or may be required to use crutches for several weeks. During the healing period, the foot should be protected from excessive weight bearing. Walking prematurely on the foot can cause the bone to shift and heal in an incorrect position. Incisions used in minimally invasive or minimal incision percutaneous surgery are much smaller, 3-5 mm. Surgeons use instruments specifically developed for these techniques which enable them to do all of the work through these small incisions for the best cosmetic result. The surgeon is able to carefully maneuver around structures adjacent to the deformity in the foot, minimizing trauma which results in reduced swelling, pain, and recovery time. Suturing is also minimal and is usually not needed at all. Surgery is performed under Fluoroscopic viewing. MIS surgeons are able to rely on external fixation in the form of a compression dressing and surgical postoperative footwear for stabilization immediately following surgery, eliminating the need for hardware and casting of the foot or crutches. The patient walks immediately after the surgery, wearing the surgical shoe or boot. Patients usually experience relief of the original symptoms, even though they experience typical post operative healing pain and swelling. Surgeries are performed at the CDA Foot and Ankle Surgery Center and are done with local anesthesia wherein the foot usually stays asleep 4 to 6 hours. A small surgical incision is used which enables the surgeon to use fine specially designed instruments to obtain the best long term pain free, functional and cosmetic results. Often times no sutures are required due to the small incision size. Dr. Nunez also uses a fluoroscope during surgery, enabling him to visualize foot anatomy during surgery in spite of the small incisions. The entire surgery takes approximately 1- 2 hours. This includes viewing a preoperative video and procedure explanation, anesthetic administration, setting up the sterile field, the surgical procedure and postoperative dressing and instructions. The patient leaves the facility walking with a special surgical shoe or boot. This will be provided for the patient. Crutches or walkers are usually NOT needed.